Westmoore Pottery was founded in 1977 by potters David and Mary Farrell. Both the Farrells had been fascinated by clay since childhood and by 1977 had a growing interest in historical pottery in particular. David and Mary had each studied pottery in college settings as well as done several apprenticeships with working potters by the time they met while at nearby Jugtown Pottery. The area appealed to them, so the Farrells established Westmoore Pottery just a few miles away, in the Westmoore Community near Seagrove, North Carolina. Westmoore Pottery has been an area presence for almost 40 years now! Gradually, as a few years went by and the Farrells did more and more research, they found that the pottery styles used in the 17th, 18th and early 19th centuries particularly captured their interest. This remains the focus of Westmoore Pottery today, best known for quality historically accurate work of that time frame. Dave began to tire of pottery, and in 2010 quit making pottery to pursue a late-life career teaching math at the nearby community college. He had been taking classes part-time for years in preparation for the switch, and absolutely loves teaching! So since the Fall of 2010, I (Mary Farrell) have been running Westmoore Pottery on my own. I have over 45 years experience and am still going strong! I especially love doing "hands-on research"on methods of making pottery as it was made in North Carolina from 1755 to around 1850. The wares I carry at Westmoore Pottery today -- my own historical pottery plus handblown glassware -- reflects my interest in preserving a piece of the past. My small book section includes texts on historical pottery and on historical cookery. I produce several types of pottery: redware, both plain and decorated; salt-glazed stoneware; and green glazed wares. All the pottery is made to be used andI use absolutely no lead in my glazes. Instead, I aim to achieve as close a look to the old wares as I can without using a lead glaze. I also do not "age" my pots. Essentially, what I am doing is trying to replicate the old pottery as it was when it was new, not as the somewhat worn antique it would be today. 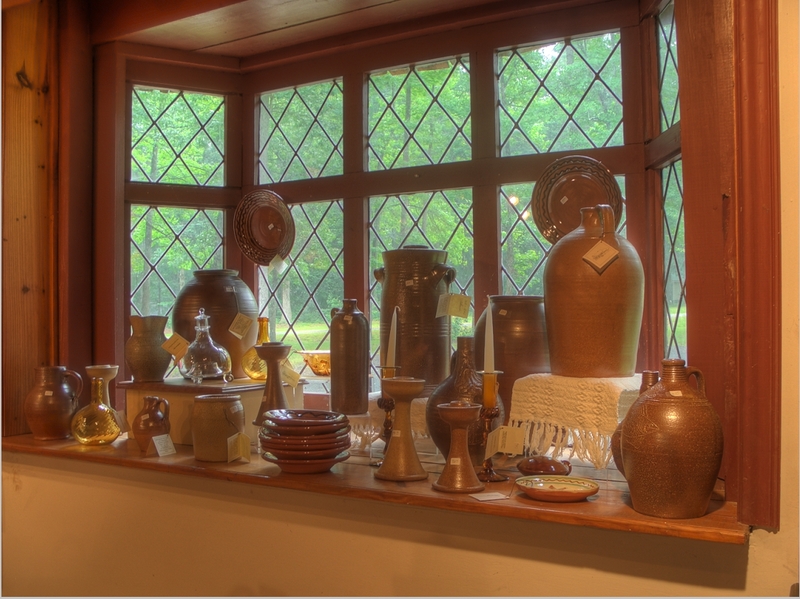 Westmoore Pottery's work has been used by over 120 museums and living history sites as furnishings for historic buildings and in programs. I have also supplied pottery and glass for a number of historically based films. Westmoore Pottery's work has been widely exhibited and written about. Pieces of Westmoore Pottery are in the collections of several museums, and the Farrells have earned Early American Life magazine's approval as among the best traditional craftsmen today. In 2010, the North Carolina Society of Historians presented Westmoore Pottery with the Barringer Award of Excellence in recognition of its work with historical pottery. Also, countless individuals who own Westmoore Pottery's wares use and enjoy them on a daily basis. Of this, we are most proud.